"The Good Men Project" (TGMP) purports to be a guiding light for a new enlightened masculinity, but panders to a feminist fantasy of masculinity instead. Paul Elam, founder of "A Voice For Men" (AVFM) says that at TGMP "you will find a deluge of feminist propaganda, manhood advice from women ...". This came to a head at AVFM after TGMP editors took down an article by Suzanne Venker entitled "Mom's Can't Be Dad's Too," in which Ms. Venker gives a first-person testimony in praise of her husband's importance to their family. Ms. Venker's article was considered controversial because she claims fathers are important to children. She even points to data that supports her own experience, quoting “The Politics of Fatherhood” by Stephen Baskerville, a leading authority on divorce, child custody and the family court system. Recent research published in the Review of Economics of the Household also supports her claim that children do better with a father and a mother. Even more research supporting this claim can be found at About.com . the anger of their mostly-female readership. The article was quickly removed and replaced with the page shown here, which states "The content that formerly appeared here did not reflect The Good Men Project's views or position and rest assured that we will work to ensure that a mistake like this won't happen again." (emphasis added). This is worth repeating: "a mistake like this won't happen again." The mistake of printing an opinion, backed-up by research, because your readership doesn't like it. “When the post was published, we got an immediate reaction that said the post was sexist and homophobic” … “because of the reaction we got” … we removed the article. Oookkaaayyy ...Ever heard of family court? Men are told that by the thousands every single day. Ever heard of te-le-vi-sion. Shows broadcast this message every day. This incident isn't likely to hurt The Good Men Project. After all, their readership is mostly women and male feminists who want to be told what they already believe, and nothing else. In fact, as Paul Elam has pointed out, this incident may have helped the rest of us properly identify what TGMP is really about. 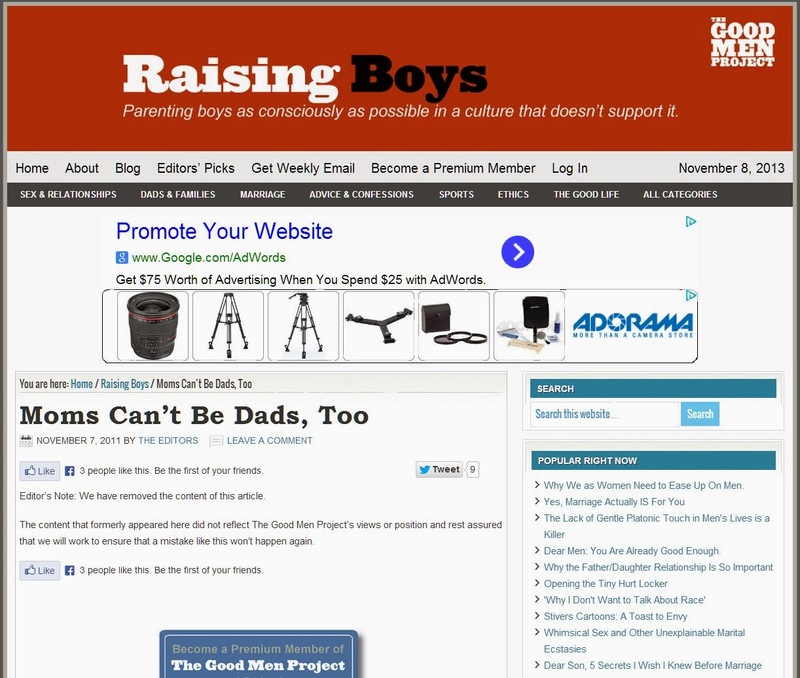 So if you are a "Good Man" looking for guidance on masculinity purged of all the controversial stuff, like "fathers are important," head on over to The Good Men Project, where your information will be filtered for your protection by an army of feminist watchdogs who will make sure your evolving masculinity doesn't conflict with feminist fantasy.